Having grown up (and spent most of my life) in the south, stories of hants, witches, and things that go bump in the night are part of the fabric of our beings. We’ve heard the stories, the “hear-tells,” since we were just wee little things. I don’t know that the south is any more prone to holding on to its spirits, or if it’s a result of the English/Irish/Scots long history of story-telling that keeps these tales going. Since most of the original settlers in the southern mountains were English, Irish, or Scottish, story-telling and acceptance of the unseen was as much a part of their DNA as hair- and eye-color. Thank goodness this has been passed down to today. I think acceptance of the unexplained is part of the reason so many have current-day tales of seeing, hearing, or experiencing things that give us the all-overs. I also think that there are some folk who are just more (shall we call it) “open” to experiencing things that are perhaps from another dimension or time. I’ve heard it called “sensitive.” Whatever it is. Some of us see or hear things others do not (and, no, I’m not talkin’ about after a few snorts). Perhaps it comes from an active imagination fueled by stories from the past; but just maybe those things really are there – just out of the seeing and hearing of most folk. I must be one of those people who is sensitive. I’ve had many occurrences of things that just can’t be explained. One of those I will recount in this post. It was something seen (and unseen until recently) on my wedding day. Let’s go back to late July in 1986. It was hot as the blue-blazes in Georgia. We lived in Marietta (which has many a ghost story associated with it due to the War Between the States). Temperatures were well over 100 degrees and the humidity was sky-high. Frankly, it was miserable, and our wedding was planned for August 2nd. The Thursday before we were due to be married on Saturday, as all the relatives were arriving in town, a storm hit. It was a storm like none other we’d experienced before (or after). There was virtually constant lightning followed by enormous cracks of thunder that continued to roll for what seemed to be an eternity. Rain came down in sheets and the wind blew to the point we worried about the 40- and 50-foot tall pine trees in the yard. Quite frankly, it was terrifying! The storm raged for almost an hour, then – as suddenly as it came up – it was gone. Friday, dawned clear and cooler. By Saturday, the temperatures were very comfortable and the humidity was gone. It was a beautiful day – especially by summer in Georgia standards. We had chosen to be married at the Planters Restaurant in Marietta, GA. This was a pre-War plantation home (previously called Bushy Park) that had survived the war and Sherman due to a pre-existing relationship between the owner and important people in the north. The owner allowed his home to be used as a hospital for Union forces. Still there were skirmishes around the home as evidenced by still-existing bullets in the framework around windows and doors. We figured that a home that had withstood the onslaught of hundreds of troops and survived through war would be a good place to begin a marriage. We planned to get married outside under a huge, old oak which had seen the worst and was still standing proud and strong. We liked that as a good omen for a strong marriage. Now for the “strange but true” part. During previous trips to the Planters (which was our favorite restaurant), we had seen some things that were a little “odd.” For example, one cool, early evening, we were walking up the steps to the front door when two of the rockers on the front porch started rocking ever so slowly. Now, there wasn’t a breath of air moving, so that didn’t cause the motion. We kinda looked at each other and went inside. It’s funny to me now that neither of us got the willies over that at all. There was no maleficent feeling or anything even remotely scary. It just seemed “natural.” I can’t explain why, it just didn’t seem at all frightening. On the day of our wedding, my mother, sister, good friend and I were getting ready in one of the upstairs rooms which had been a “lady’s” bedroom. What a beautiful, sweet room it was. I felt completely at ease there. I should have had butterflies in my stomach – I was, after all, getting ready to vow to spend the rest of my life with the man of my dreams. Instead, I felt intense calm. I will say that all three of the other ladies were a little “jumpy,” but I put that down to excitement. When the staff member in full, long, war-era dress brushed by the door and just peered in for a moment with a sweet, but almost-sad smile, I thought it was nice. Then I realized, they don’t have staff wearing period costume. My friend went to go look out the door to see what I saw and there was no motion anywhere. She did remark that the hallway felt “cool,” but nothing beyond that. Still, I didn’t feel anything but calm. I honestly felt as though I was being watched over. There was such a strong feeling of comfort, strength and happiness that pervaded the entire ceremony and gathering afterward. I honestly felt as though the “house” was wishing us well. Flash forward to just this year. As Jim and I were preparing to celebrate our 31st anniversary, some friends were asking if I could share any of my wedding photos. I also put one up on Facebook. I really didn’t think anything of it – that way, until I saw it. There in the photo, looking back at the camera in the window was the unmistakable outline of the head of a German Shepherd Dog. Both Jim and I have always had affinities for that breed (as most of y’all know and can tell from my previous posts). By the way, this room was on the second floor. Was this my spirit animal watching over me? Was it a trick of light? What do you think? I’m sad to say that The Planters is no longer a restaurant; however, the building still stands. I hope it will continue to do so for another 150 years. For those who watch over it (whether from this world or the next), I am forever grateful. 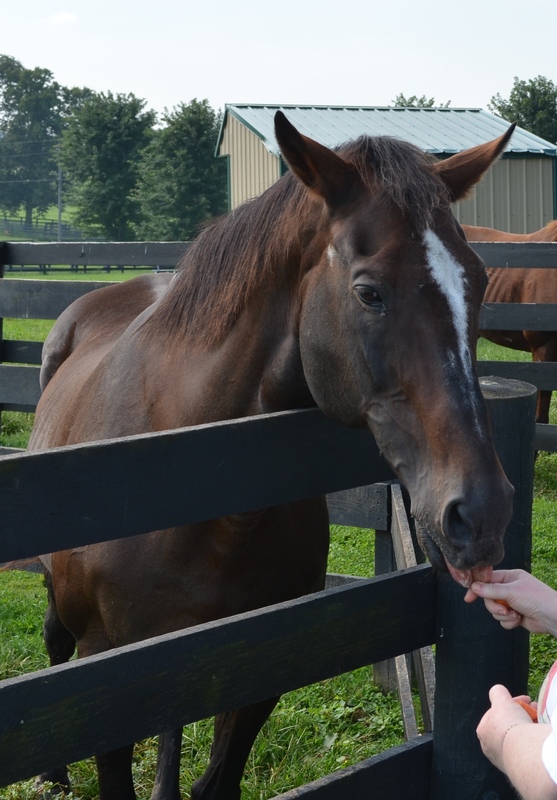 Being a Kentucky-bred, it’s only natural that I would have an affinity to two things – horses (and those of you who have read my blog over the years know that this is true of me) and bourbon. I’ve said before that I suspect that the first inoculation given at birth in Kentucky involves the development of love for horses and bourbon. 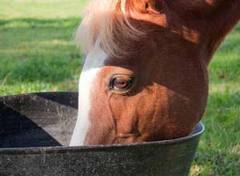 While it seems that the love of the equine was immediate, the appreciation of bourbon took some time to acquire. My heritage (as I have recently learned) is Scottish, and Scotch whiskey was the first brown liquor I developed a taste for. Part of my college education was in London, England where I learned to drink Scotch. It was an integral part of my education. It wasn’t until I was in my very early thirties that I decided it was time to learn more about bourbon. I was so incredibly lucky that my first foray into bourbon was on a recently-introduced, single-barrel bourbon called Blanton’s. Why was I drawn to this particular bourbon? Take a look at the bottle. Seriously! It was the horse and jockey. Master distiller, Chris Morris, was the professor and there were roughly 30 eager pupils. First, we learned a little about the history of Woodford Reserve. It was originally known as Old Oscar Pepper Distillery, but they began distilling whiskey in 1780 on the banks of a glorious stream. The water is so clear and so pure due to the limestone, it was a natural location to start distilling. The distillery building was erected on site in 1838. It is actually the oldest of all the distilleries in the area, although it was closed for quite a while. Brown-Forman bought the property in 1993 and refurbished it to bring it back into operation. The Woodford Reserve brand was introduced to the market in 1996. THIS is the water that makes Kentucky Bourbon GREAT! We started out, by learning about charring the barrels. The amount of char on the inside of new, American white oak barrels is critical to the taste and quality of the bourbon which comes out. We did our own “char” by building a fire inside a barrel. It was a little too windy, but the visual was sufficient to give a greater understanding of how many different levels there are in making a really top-notch bourbon. We got to stick our fingers into the developing sour mash. It was amazing the difference in the tastes between the new mash (like a bland breakfast cereal) and the final vat (seriously getting sour and looking on top like someone’s pizza). We saw the gorgeous copper stills and learned about how the process of successive distillations makes the clearest, highest quality distillate. Notice, I didn’t call it bourbon yet. At the point where it comes out of the still, it is just alcohol – or “white dog.” It’s the aging in the oak barrels that turns pure alcohol into bourbon and gives it all those marvelous flavor notes. We learned all about the flavor wheel in an exercise, led by resident chef, Ouita Michel (a James Beard Award nominee). Who knew there were so many different flavors to discern in bourbon? We got to taste different nibbles of food paired with bourbon to see how the flavors changed. I had never thought about considering pairing food with bourbon and how different bourbons would go better with certain food items, but I sure learned a thing or two about that. I’m absolutely rethinking Thanksgiving dinner pairings. I think a good bourbon would pair beautifully with all the flavors in turkey and dressing. I absolutely know that bourbon and pecan pie are made for each other. We had an outstanding lunch and got to sample several different bourbons and Woodford’s bottled version of “white dog.” All of the bourbons were from Brown and Foreman’s stable of bourbons. Jim and I both favored Woodford’s Double Oaked – a relative newcomer to their offerings. Upon graduation, we each got our own bottles of Woodford’s flagship Reserve. These were very special bottles as they have our names and graduation dates etched right into the bottles. What a nice touch! If you ever consider taking the one-day course, I would emphatically tell you to go for it. 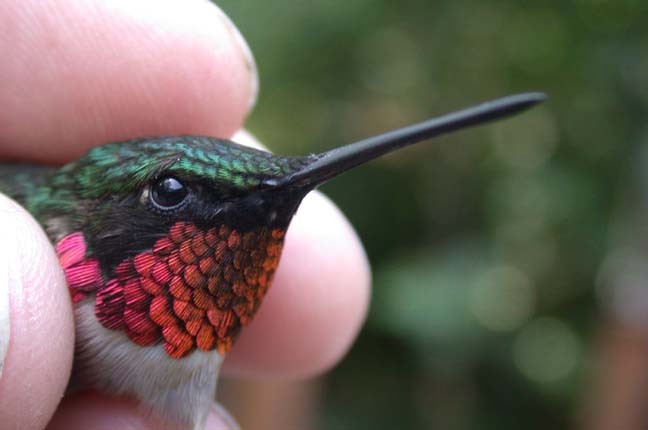 Ever since I was a little girl, I’ve loved hummingbirds. Their beauty and swiftness are a given, but their feistiness speaks to me. Have you ever heard them squeal? Oh, my! It sounds like someone is pulling their little wings off. Of course they aren’t, it’s just their vocalization. When we moved to Michigan (almost 8 years ago), we had the great fortune to get to know Allen Chartier with whom we’d “chatted” online for a number of years. 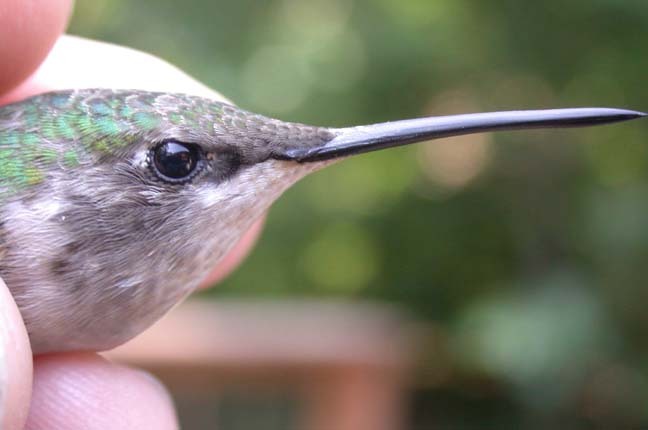 Allen is a bird bander who works with all birds, but is also able to work with hummingbirds. 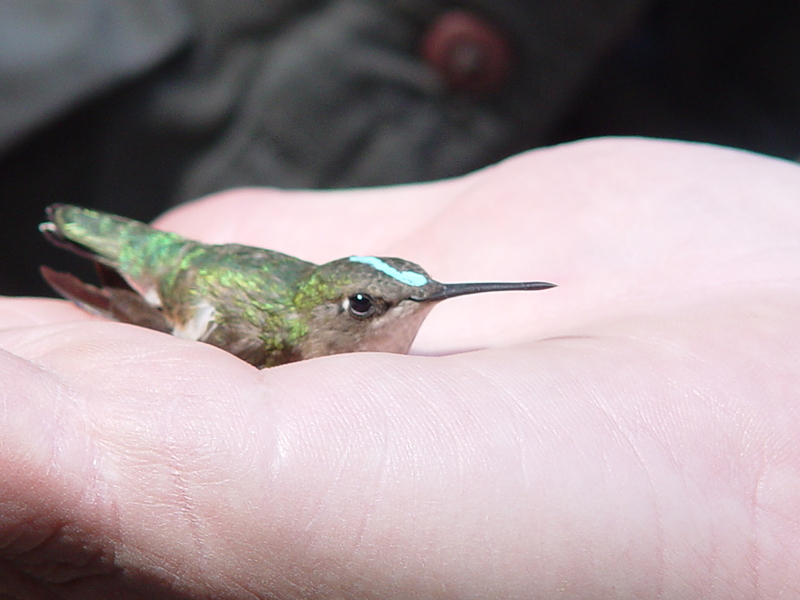 Banding hummingbirds (as with all birds) helps science learn more about migration and breeding habits. 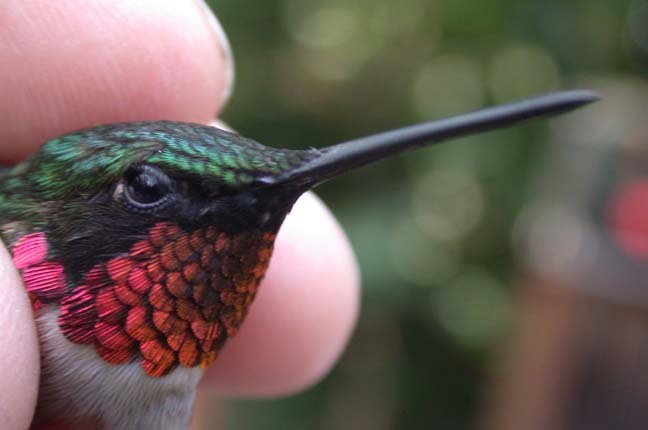 It also enables you to get up close and very personal with flying jewels. 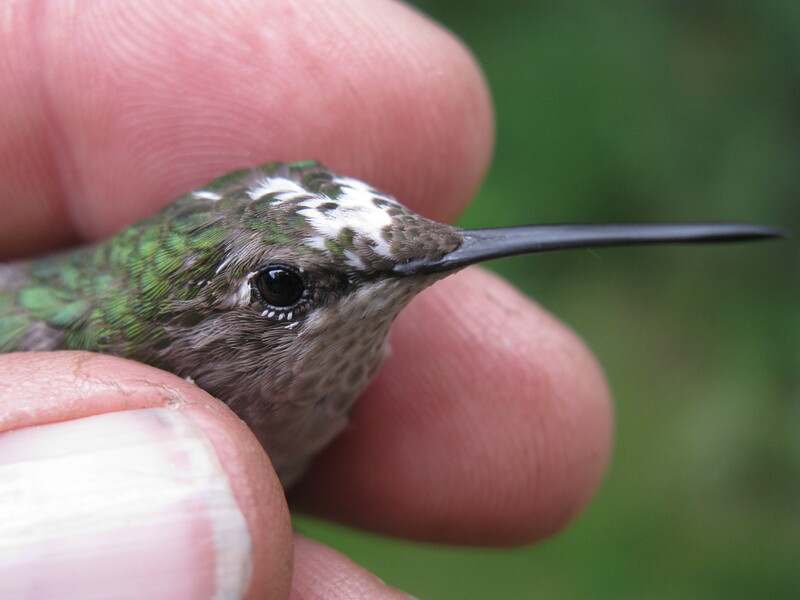 So, how do you catch a hummingbird? In our case, we use a trap. Now, don’t start envisioning something with jaws and metal teeth. The trap we most often use looks like a wire-mesh drum. A feeder hangs in the middle , with a door that opens (and closes via remote) and a human arm access door on the opposite side. I’ll go more into that in a bit. It’s time to take down all the feeders. We do this to limit the sugar optons to the feeder inside the trap. At first, the birds will be confused. We never start banding at first light so that the birds can get their first feedings of the day. They will find the feeder inside the trap. They will do the “hummer dance” first. The hummer dance is when they hover all around the outside of the trap looking for a way to get to that feeder. Once they find the open door, they go in. We try to wait until they are on the backside of the feeder or perched. Then, we push the remote and the door closes. They’re in the trap. It’s my turn! I open the access door and stick my arm in. This is the time where I still hold my breath. I know these little buggers are tough, but they are also delicate creatures and catching them gently but firmly is an acquired ability. Once I’ve got him/her I quickly move them to a mesh bag. The bag holds them comfortably and they usually calm right down when they know they can’t fly off. It’s all up to the bander now. He takes the bird from the bag and places it in a nylon “sock” and affixs the band around the hummer’s leg. He then weighs the bird and takes measurements. The measurements include looking at the bird’s bill. If it has corregations, it’s a hatch-year bird. 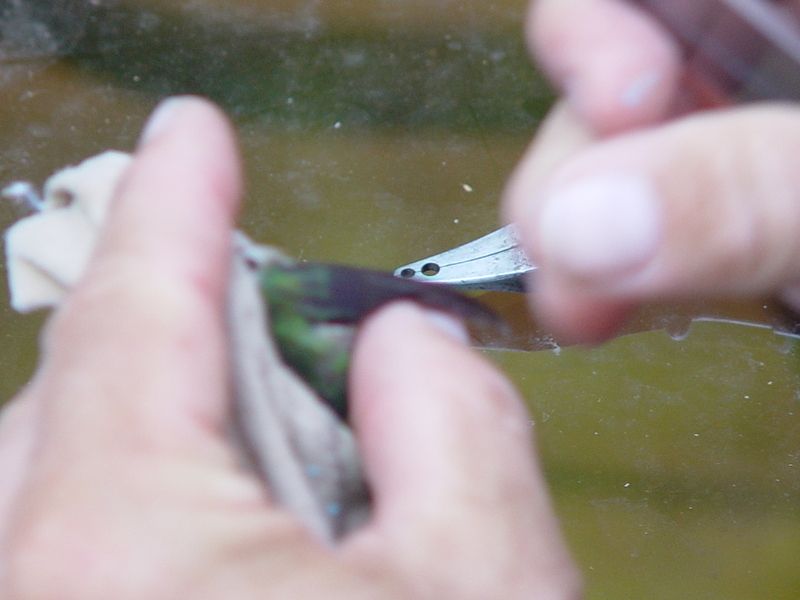 Tail feathers are checked and measured as is the wing. The bird is also checked for body fat (especially as migration comes close) and females are checked for either carrying an egg or showing a brood-patch. A brood-patch is an area on the female bird that shows wear from sitting on a nest. 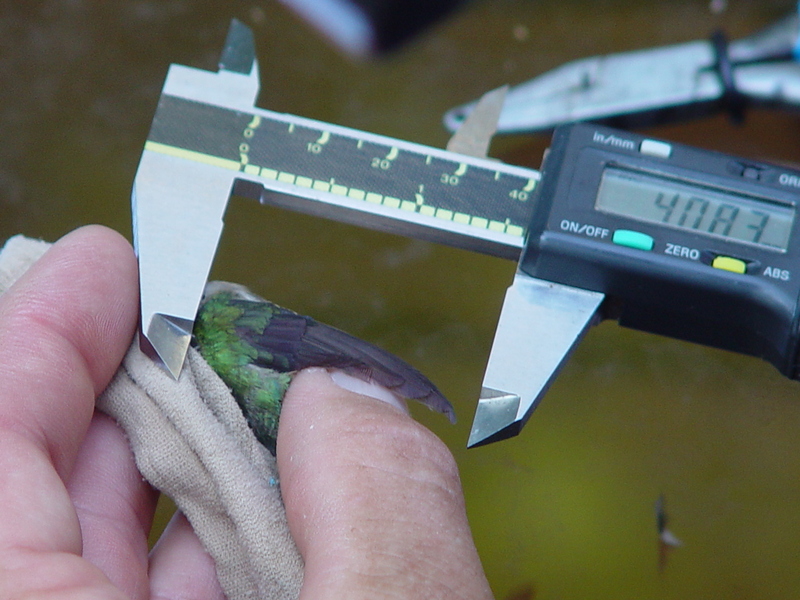 Once all the measurements are taken, the final step is to color-mark the bird’s head. In Allen’s case, this is similar to colored “white out” which will wear off over time. This way, I can recognize the birds that have bands each time they come to the feeders. 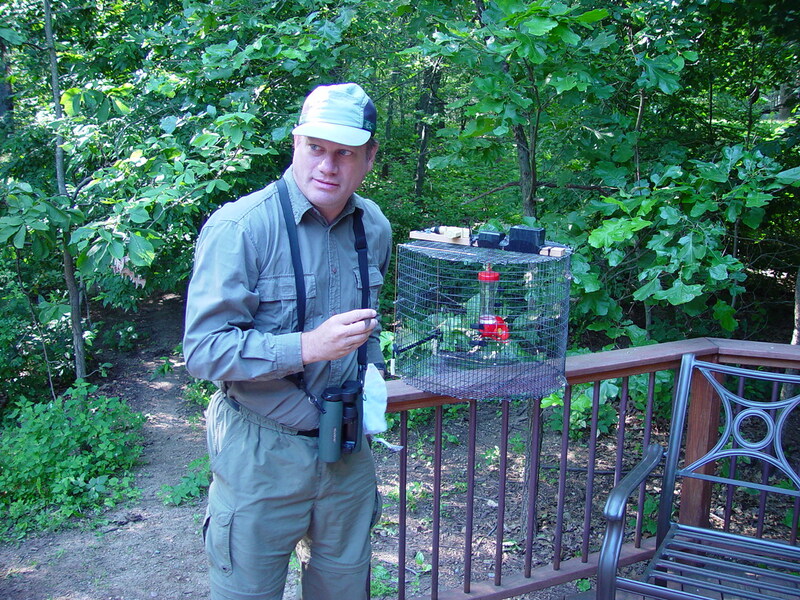 Another benefit to color marking the bird is that it’s immediately recognizable should it go back into the trap. It would be released immediately. The later it gets in the season (after July in Michigan), Allen will stop color marking. So, what happens if the bird already has a band when captured for the first time? The same procedures are followed (well, except for adding the band). The bird gets two color dots. 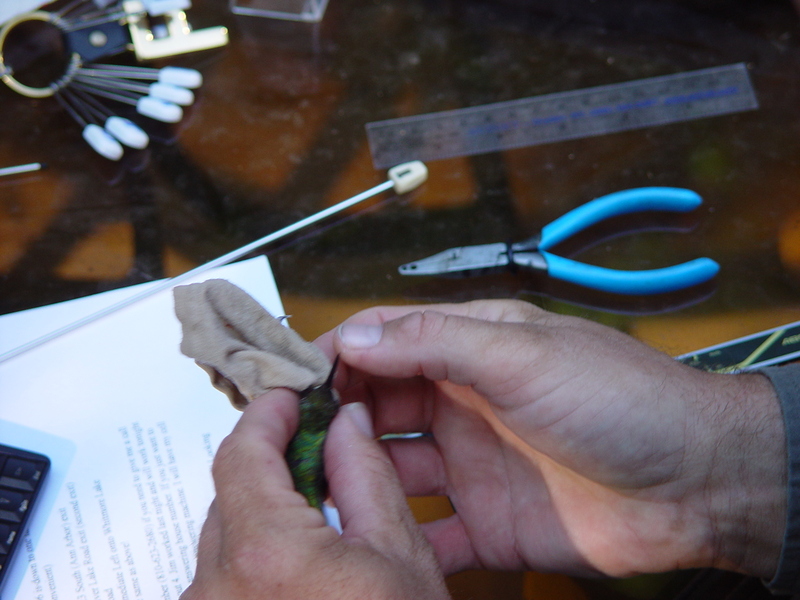 Once the band is on, all the measurements are taken, and the color dot(s) is on, the great part comes … releasing the bird. You hold your palm open and the bird sits until it’s comfortable that It can go. Sometimes that’s immediate. Sometimes the bird sits a few seconds. Take advantage of that moment to feel it’s tiny heart beating. It reminds me of a cat’s purr. Frequently, the bird hasn’t figured out it can fly away. Gently rocking it side to side generally gets the bird to realize it’s no longer being held. A gentle puff of wind under it’s tail can be utilized should the rocking not work. Occasionally, the bird will sit longer, but that’s pretty rare. They don’t want to stay, they just don’t realize that they can go. Once you see the bird fly away, it’s a great feeling. This bird is probably a hatch-year (new baby) male, but can’t tell for certain if the throat is clear (adult female) or has light streaking where red feathers will come (hatch-year male). 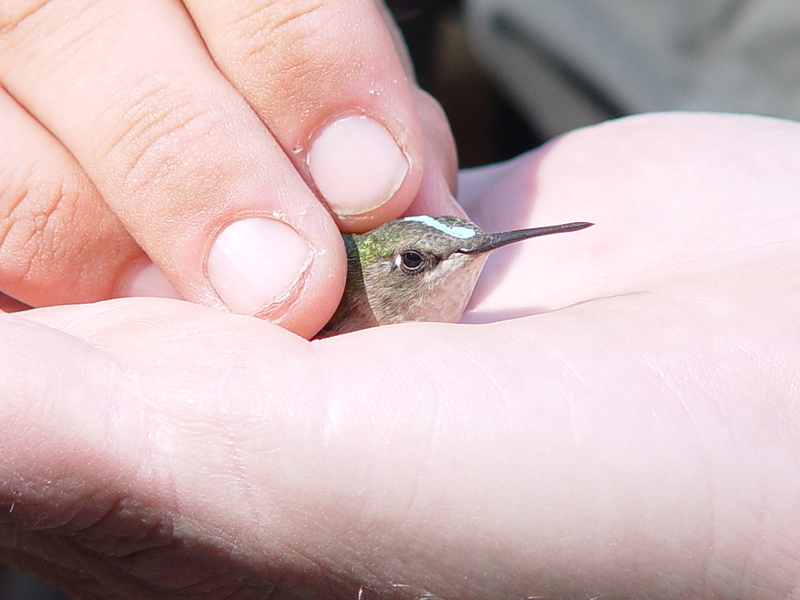 If you ever get the opportunity to watch or get involved with hummingbird banding, go for it! It’s the closest you can get to one of nature’s masterpieces. If you’re reading this in email or on Facebook, click on the title! It will take you directly to the blog (an easier viewing page.) If you’re already in my blog, WELCOME! Some of you who read this blog will remember a television show on ESPN called “Racehorse Digest.” It was a weekly show, hosted by Chris Lincoln, which ran from 1982 through 1998. It was a great show that recapped the important races from the previous week and discussed many of the races which were coming up. It was a terrific show that is still the standard by which all current and future shows will be judged. One of the great segments on “Racehorse Digest” was called ‘Talkin’ Horses’ with Dave Johnson. In that segment, Dave talked to individuals about their involvement in horse racing. Sometimes he spoke with owners, sometimes trainers, and sometimes jockeys. Some of those segments can still be seen on YouTube. They were fascinating glimpses into the sport through many different angles. In one segment from October of 1989, Dave Johnson interviewed three women who were ‘Talkin’ Horses’ through a new medium called “the internet.” These three women had met through the old “Prodigy” in a Horse Racing Bulletin Board. They were part of a larger group who had all become acquainted through discussions of horse racing and horse breeding on that one, very early, internet site who had come together at Keeneland Race Course in Lexington, Kentucky to enjoy a weekend at the races – culminating with the Spinster Stakes. 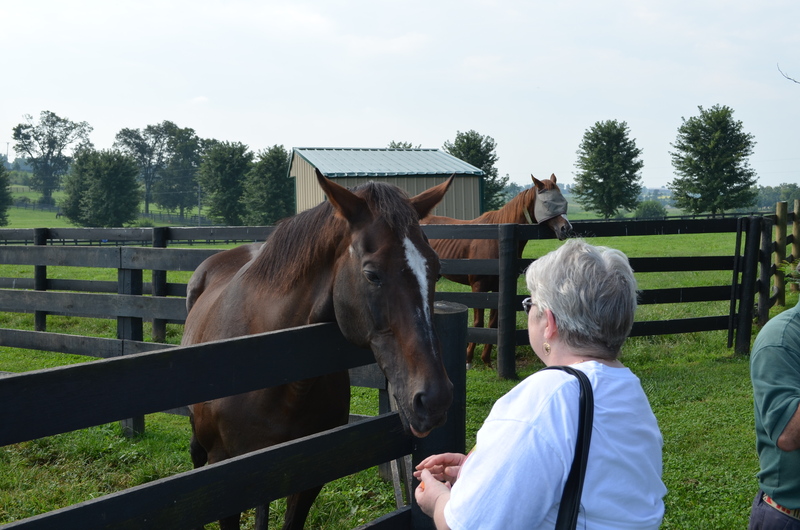 The three were known as “#1 Kentucky Filly,” Leslie (went by her real name), and “Teach.” These three had formed a friendship and had become three very recognizable voices on the site. “The #1 Kentucky Filly” specialized in horse racing – especially at Keeneland. Leslie was an owner/breeder from Washington (state). 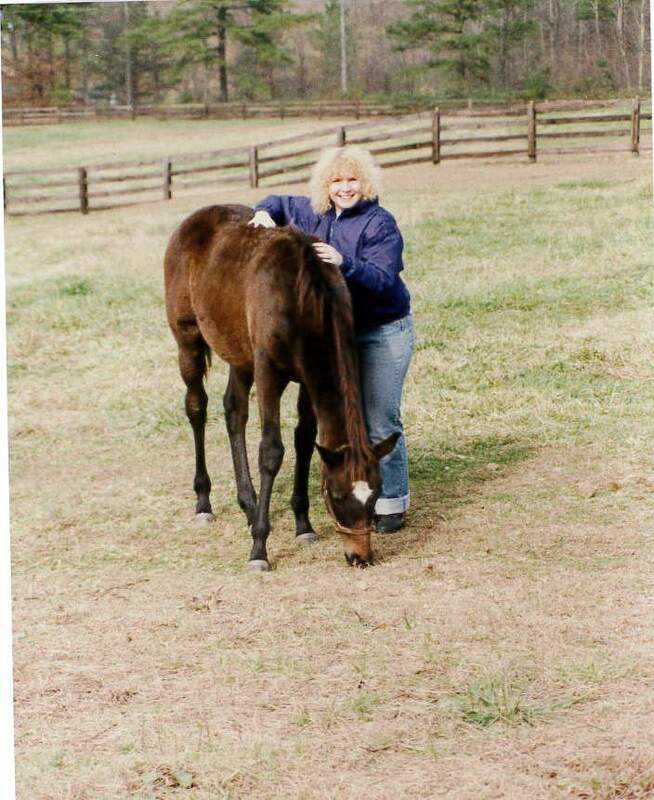 “Teach” was an owner/breeder/pedigree student from Georgia. If you’ve been reading my blog for a while, I’m betting you can guess who “Teach” was. Yep, yours truly. My “specialty” on Prodigy was looking up pedigrees of racehorses and stallions and giving my predictions as to which would be the most successful either on the track – especially considering different types of racing (sprints/distance, dirt/turf, etc.) or in the breeding shed. Incidentally, I didn’t give myself that title, it was conferred upon me. Our segment of ‘Talkin’ Horses’ was about the “new” idea of people from all over the country getting together on this new medium discussing horse racing. We were concurrently thrilled and terrified to be featured on a national television show, but we got through it. We were later told that our segment was one of the most well-received in that program’s history. Today, there are any number of places on the internet where horse racing, ownership, and breeding are discussed. We’ve come a long, long way in 25 years; but it’s so much fun remembering back to those days on “Prodigy,” friendships made, having my 5 minutes of fame, and the early days of the internet. This post was written in loving memory of my dear, dear friend, Peggy. 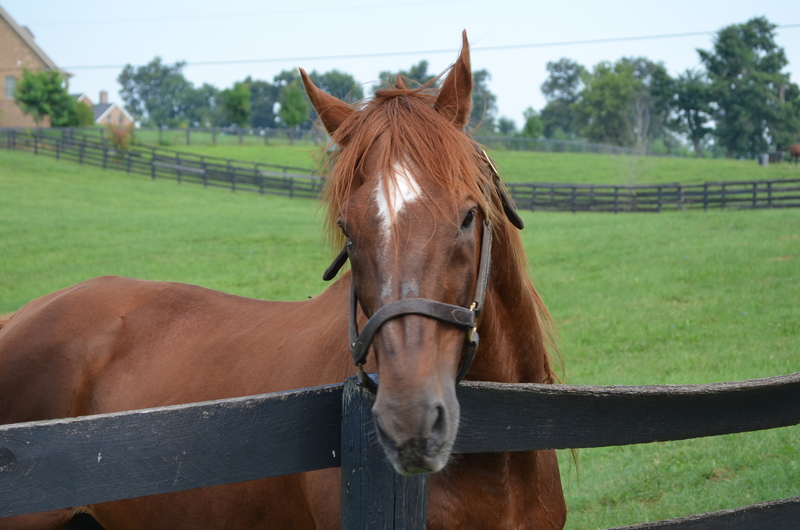 She was – and always will be – The #1 Kentucky Filly. I recently have been involved in an ongoing thread of posting crazy/funny horse stories on “LinkedIn.” There is a group there called “Horse Lovers of the Business World.” Some of these stories made me laugh so hard! Others brought back funny memories of my own. I thought I’d share some of these remembrances with you from time to time, and hopefully bring you a smile and/or a chuckle. The first is a true story from my life. Gosh! Where to start? I guess I should get into the “Way back” machine and tell one of the first funny stories from my childhood. 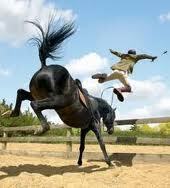 When I was about eight years old, I was an aspiring equestrienne. I took saddle-seat lessons from a crusty, old horseman who (I firmly believed) enjoyed watching his students in precarious positions. To this day, I’m sure he put me on Midget as a joke. Midgie was an off-the-track Standardbred trotter. Of course, here I am in my riding class when Ben calls us to trot! Off to the races we went! Midge didn’t have a regular trot in her DNA. So here we are zooming around all the other horses. (I’d pulled her to the inside “passing” lane.) Needless to say, I was posting like a maniac. Up, down, Up, down, Up… you get the picture. I was too young to curse, but I would have been had I known how. All of the sudden, the stallion out in the far pasture starts bellowing. Midge stopped dead in her tracks. She stopped. I didn’t. Off I flew in the most amazing arc. Luckily I was just a little kid, and had been taught that if I was going to fall (and all riders fall), think “sack of oats.” “A sack of oats never broke a bone.” After I picked myself up, I stomped over, grabbed Midget’s bridle, smacked her several times in the legs with my crop, and hauled myself up on her back before anyone could say or do anything. Funny thing, I gained some kind of respect for that from my instructor and I guess even old Midget. She never dumped me again. Oh, and I even got to ride some of the “better” horses for lessons on occasion. Encouraging him forward did not even budge his focus on what was causing this “FLIGHT” response. I knew I had to get him out of it or I was in for a real problem; he is one strong boy. Still thinking it’s the mud, I get real firm and, nope, he would not budge from his fixation. He then starts backing up which in itself is not unusual, but this time he backed into the bush. Now I am getting quite annoyed really mud should not cause this much problems; he is a scardy, cat too. Backed far enough into the bush I am effectively pinned to his back can’t get down to lead him, trees not even allowing me to get much of a kick in. Then I see it “The Cyclist.” Oh my he hates them scary monsters. The trail is a good distance from the road so really!!!!! He now starts setting back on his haunches like a cat ready to spring on its prey; What the heck is he doing now I wonder. As the cyclist approaches and goes by, Montana leaps out of the bush at it and gets off a little buck; that I was used to by now. He then starts to prance about and I turn him back up the trail. He went through everything after that with me laughing my head off. He scared the “Evil Cyclist” off and now demonstrated the confidence to take on anything; mud, deer, dogs, etc. My guy’s name was America. He was a big, old, palomino quarter horse with an appetite for snacks and quite a sense of humor. I call this story America’s freedom! We heat our home with wood so I get up in the middle of every night to reload the fireplace. I will admit that I do this in a half sleep daze! One night while I was putting wood in I thought that I heard Lady whinnying. I ignored it and finished what I was doing. I headed back to bed and heard it again so I turned on the front porch light and poked my head outside to see the paddock. I saw Lady standing there and everything looked fine so I shutoff the light and closed the door. Lady starting making all kinds of ruckus so I put on my coat and boots and opened the side door which kicks on the yard light. There stood America in the driveway! I almost had a heart attack. I grabbed a pair of gloves and went out. He knocked over the grain bins and was eating. 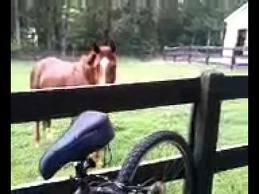 I looked to see if the gate was open and it was still latched. I opened it and put him back in. I couldn’t understand how he escaped so I got the quad and started driving around the pasture with a flashlight. Picture the dark of night, in a nightgown, motoring around with a flashlight. At the far back corner the fence was knocked down with deer tracks running through it in the snow. After the deer knocked down the fence America was going to have a midnight snack! Good thing that Lady was so mad that he was out there without her, or else she probably would have never “told” on him! Needless to say all is safe and sound now. I was in a panic when this was all happening but now looking back on it I find it all quite comical. My Paint gelding, Zip, loves to help around the place. When he was about 2, we were putting up gates and nailing fences, and he grabbed a hammer form the pile and swung it hard enough to hit the post we were nailing on. He was happy as a clam. We laughed and laughed. Then he hit my partner in the kneecap. I bought Zip his own tool caddie and gave him a couple of screwdrivers and a wrench, and he was the happiest subcontractor you’ll ever see. He’s 18 now and owns his own broom for sweeping in front of his stall (a clean aisle is a safe aisle, he always says) and has 22 tricks in his repertoire. (I absolutely ADORE this horse and the stories Joanne has told. You would probably enjoy her blog as well! It is www.joannemfriedman.blogspot.com . Did this remind you of some funny stories of your own? Please share them with us. They don’t have to be horse stories. If you’ve read my blog over the years, you know anything is fair game – Dogs, horses, cats, husbands (errr… Well, why not? ), etc. Just post you story in the comment section below. So, what’s this about Secretariat? THAT Secretariat? Yes, there was only one; and in 2013 racing celebrated the 40th anniversary of his amazing Triple Crown. Even if you don’t follow horse racing closely, I’m sure you’ve heard of the Super Horse of 1973 (and 1972)! Secretariat was a phenomenon. He was not undefeated in his career, but – in my mind – that only goes to prove that this was a flesh and blood athlete who, when he was at the top of his game, was the best that ever was. The 44th anniversary of his birth is rapidly approaching (March 30), so I wanted to make certain that my remembrance was posted before the celebration. There are those who say that Man O’War was better. I couldn’t say for certain. I don’t know that anyone truly can. Those who saw them both run couldn’t even agree. Let’s just put all that to bed and say that they both were bright, immensely talented, beautiful-to-look-at, beings who inspired legions with their ability to run. They were immediate celebrities who captured the attention and imaginations of generations. That’s a lot to say about one horse – let alone, two. Secretariat also came into our lives at a time where the country desperately needed a hero. We had been through years of the tortuous and divisive war in Vietnam. On the heels of that, there was the Watergate scandal. To say that there were a great number of us (especially those of my age group) who were becoming increasingly disillusioned was putting it mildly. This was the early times of the “hippie” movement and counter-culture. Secretariat was a bright, shining beacon of truth and beauty. Even those who had never seen a horse race or had any previous interest in horses tuned into the innocence and power of the amazing, chestnut. 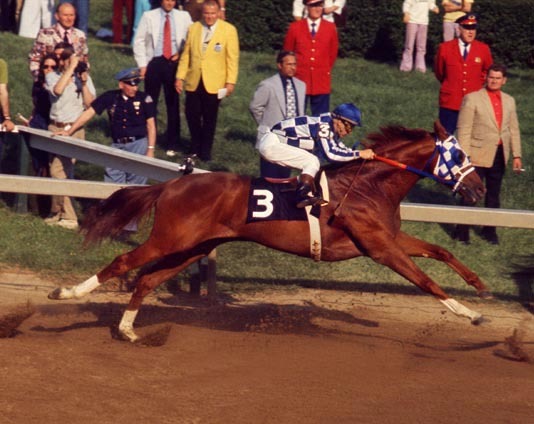 Secretariat, in full flight, was almost a mythical beast. His stride (which later turned out to be the greatest measured) ate the ground. He was poetry in motion. It was a kind of beauty that almost everyone could appreciate. and painted him (this is Secretariat – Final Tribute by the incomparable, Fred Stone). 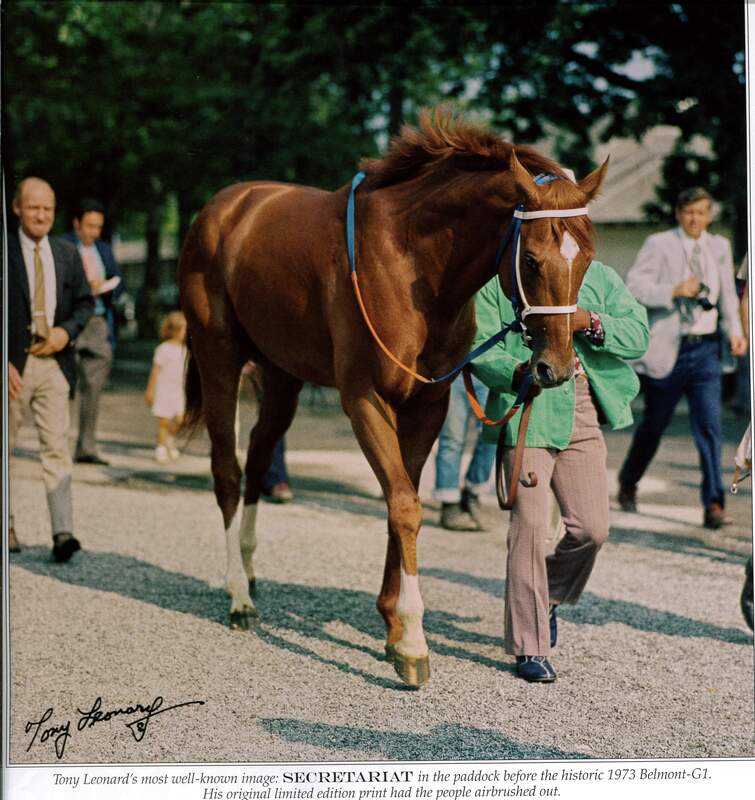 Much has been written about Secretariat the race horse. There have been terrific books (I especially like the one written by William Nack) and even a feature movie about him. This post is a more personal look at the great horse as I knew him. 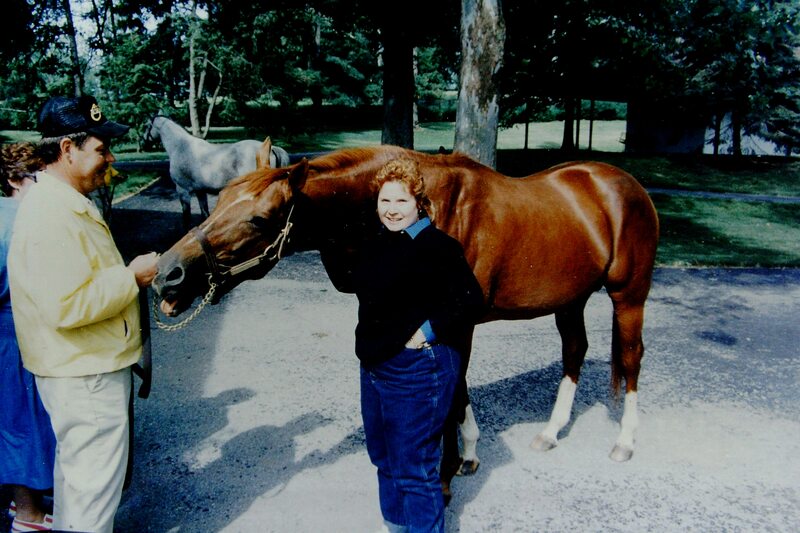 My “relationship” with Secretariat came many years after his heroics on the track. As you may have learned from earlier posts, my husband and I were in the thoroughbred breeding and racing business for a number of years. My first visit to Secretariat, though, pre-dated that time in our lives, but not by much. Did meeting him have any bearing on our decision to go into the business of breeding and racing horses? Probably, but not directly. We were living in Georgia, and took a road trip to visit family in Michigan. On the way back, we stopped first in Louisville, Kentucky. 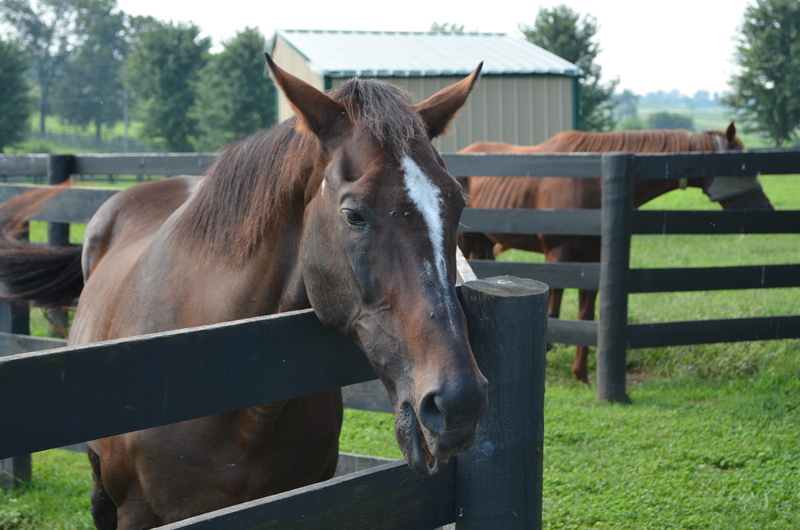 One of the pamphlets available at the Kentucky visitor’s center outlined different tour groups that were available to the general public to visit horse farms in the bluegrass. I have been “horse crazy” all my life. (Perhaps that’s a by-product of being born in Kentucky.) 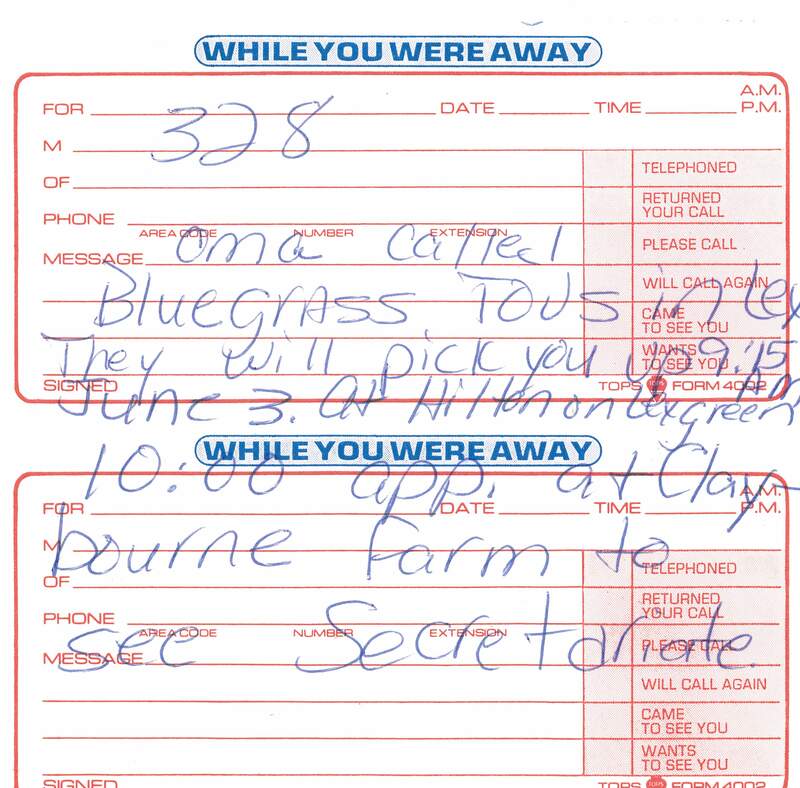 We called and requested a tour to Claiborne Farm where Secretariat held court. The tour company said that they would do their best, but that there were no guarantees. We told them where we’d be staying in Lexington and they said they would leave word as to whether or not they were able to book the tour. When we arrived in Lexington, this message awaited us! I have to say that I honestly don’t remember any of the details beginning at this point until we arrived at Claiborne. I’m sure I enjoyed the amazing scenery (beautiful tree-lined roads and the stacked-stone fences of Paris Pike), but my only thoughts were that I’d actually get to see the horse that I’d dreamt of for so many years. 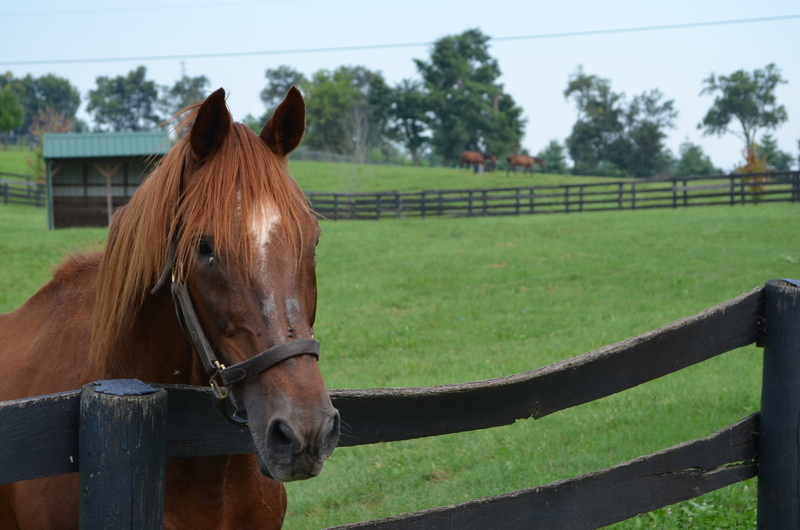 I do know that I thought I would see Secretariat (or “Red” as I came to call him later) in his paddock and at a distance. Imagine my amazement when he was led out of his stall on a lead and brought in our direction. I’m sure I was breathing; but, at that moment, everything else was blocked out of my vision. Walking right up to me was the most amazing horse of all time. As you can see from these photos, I got to actually “touch” him. I couldn’t be bothered to take the camera. I only wanted to stand next to him and spend all the time I could in his presence. Funny thing, the big guy knew he was being adored. I’m sure that he was used to being shown to people from the time he was a foal. His whole life had been documented by famous photographers and award-winning authors. He was totally happy being fussed over by his public. He was the consummate gentleman. From the moment I first met him, I knew I had to take every opportunity afforded me to visit. It was quite shortly after that visit that we entered the thoroughbred business. Jim and I made many trips to Lexington to evaluate potential mates for our mare, Permanent Cut. 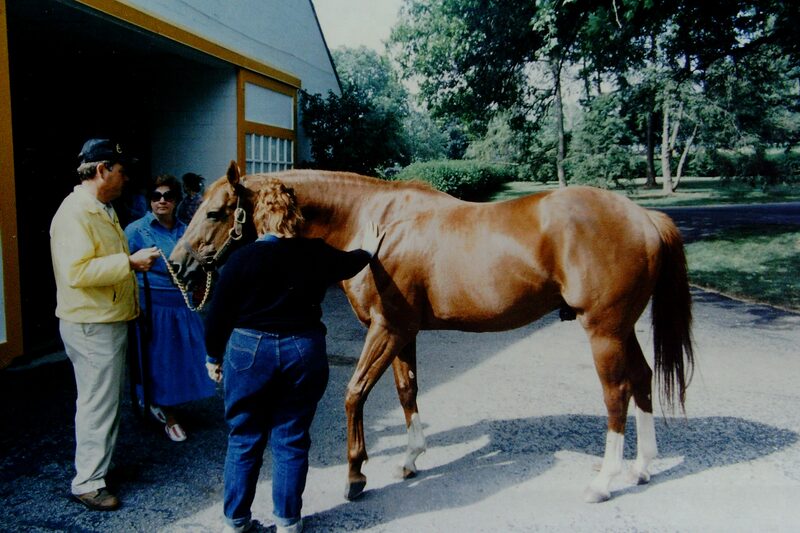 Each time, we would visit Claiborne to both see the stallions we might possibly purchase seasons to and to visit Red. We never failed to bring the requisite “starlight” mints. Each time we approached his stall door, I’d start to un-wrap a mint (I must mention that we always got permission first). Red sure knew that sound. He’d nicker and have his head out of the door before we could get there. After giving him the mint, he’d stand like a child’s pony to be rubbed and fussed over. The last time this scenario played out was when we were visiting just prior to the 1989 Kentucky Derby. We visited again in August, but were told that Red wasn’t feeling well and might not come to the door. We were also told that we shouldn’t offer him a mint. We walked to the stall door and looked in. Secretariat was standing in the back of his stall facing away. I called to him and he turned his head, but didn’t walk over. I could tell, then, that he wasn’t feeling well, but had no idea how badly he was doing. On October 4, 1989, I was driving home from work in Atlanta. The radio started to report the death of Secretariat. I had to pull into the nearest parking lot. I sat there, at first in shock, then crying my eyes out and sobbing. It took quite a long time until I could compose myself long enough to drive home. Once home, I told Jim that I’d heard that Red was gone. It was on all the evening news stations. 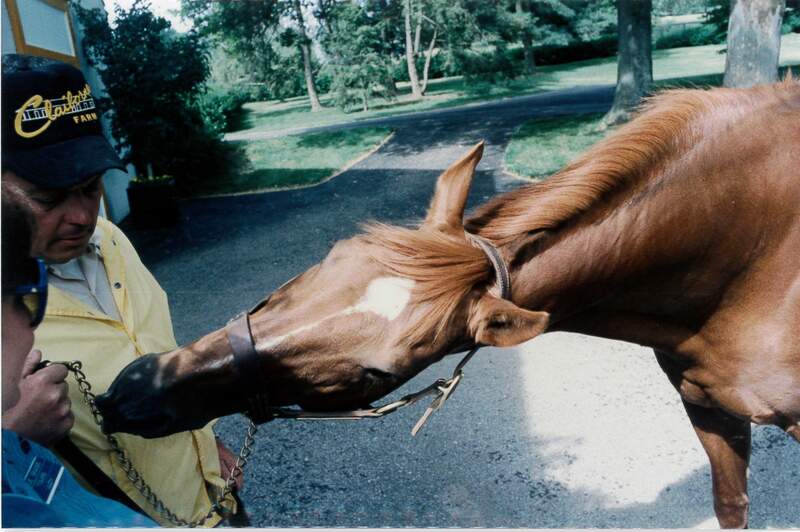 Even 16 years after his Triple Crown triumph, Secretariat was news. He was a legend in his own time. 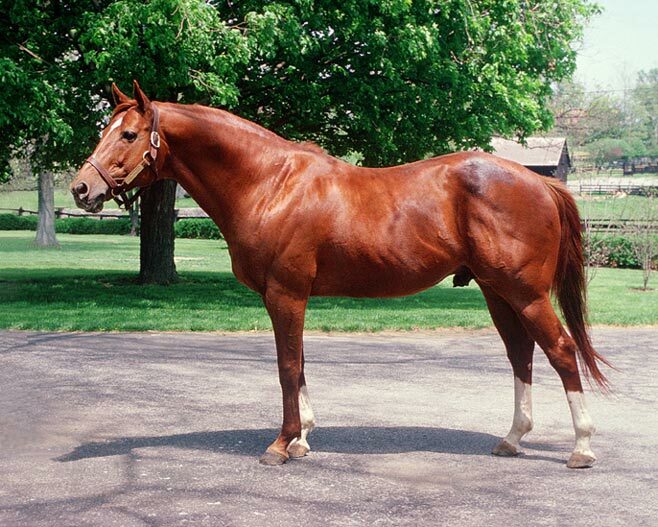 Many terrific horses have come and gone since Secretariat. Some have caught the imagination of many; however, none have inspired such a multitude as Secretariat has. 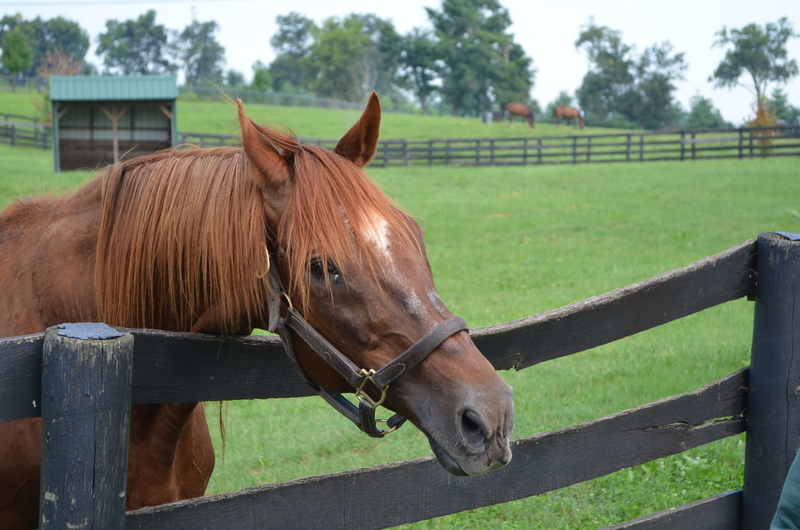 To this day, with the recent Disney movie, Red is captivating a whole new legion of fans – many whose parents weren’t even alive when Secretariat blazed into history. I’m just so very grateful that I was able to see this spectacular being, not only break all the records with his racing, but to get to know the horse, himself. I doubt that there will ever be another. 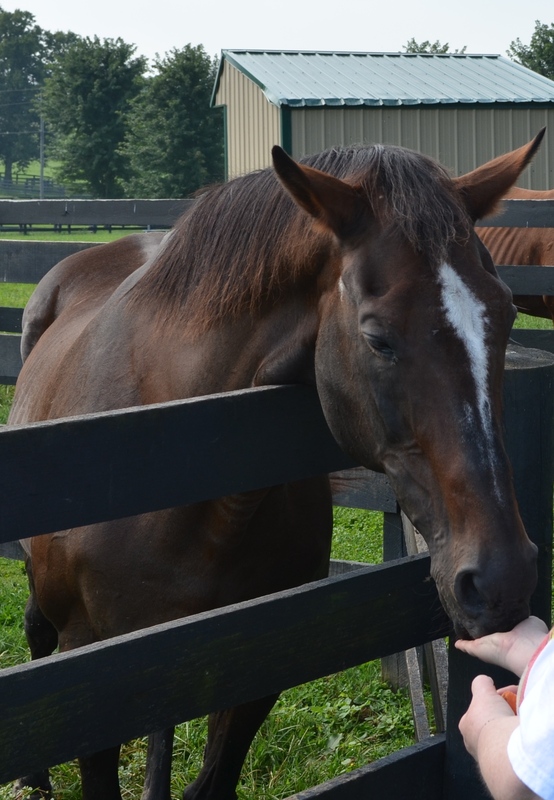 In the last post, I talked about some of the wonderful horses (the “Grand Geldings”) I got to be reacquainted with at “Old Friends – A Kentucky Facility for Retired Thoroughbreds” (www.oldfriendsequine.org ). I’m grouping these two horses together – the superstars – because they both had amazing records, have legions of fans, and have been together for quite a long time. Creator and Sunshine Forever. Sunshine Forever and Creator. Either way you say it, they belong together. They were the first two stallions to ever be returned from Japan to the U.S. for retirement. Creator was foaled on June 1, 1986 in England. He was purchased and raced by Sheikh Mohammed bin Rashid al Maktoum, a member of the ruling family in Dubai. One of the final foals by the great Mill Reef, he did not disappoint. Creator raced primarily in Europe – England and France, but his last race was in the United States where he finished third in the Budweiser International. In Europe, he was a bona fide star at ages 3 and 4. He raced on both dirt and turf, winning seven times and bankrolling over $500,000. His greatest wins were Group 1 and 2 races including, the Prix Ganay (G1) (which his sire also won), the Prix d’Ispahan (G1), the Prix d’Harcourt (G2), and the Ciga Prix Dollar (G2). 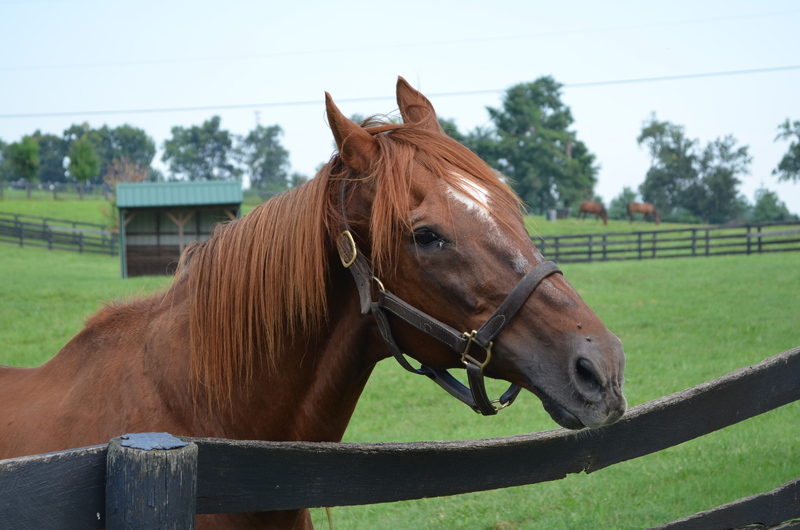 While Creator was best known for racing in Europe, his stud career took him to Japan where he and Sunshine Forever stood at Nitta Farm. He has become quite a favorite at Old Friends where his regal presence makes you forget that you are looking at a 25-year-old (now 26) stallion. As you can see from the photos, he’s a magnificent-looking individual. 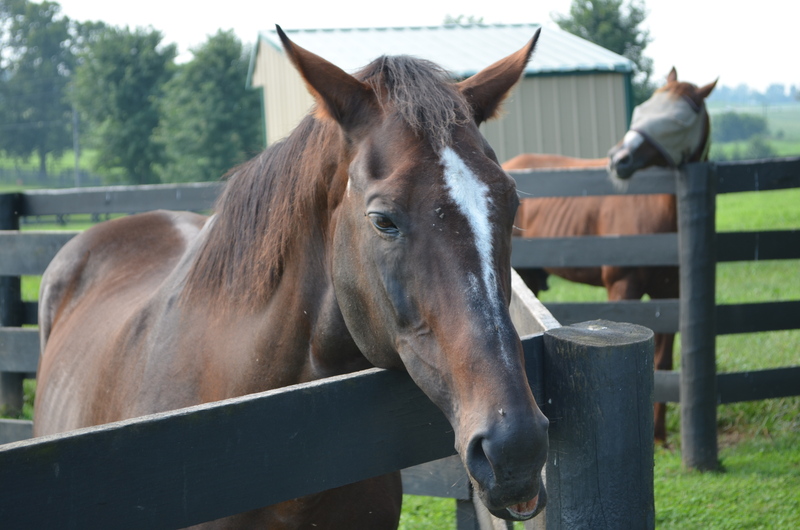 He is one of those bright, coppery red horses with a white star that seems to “dribble” a little down his nose. Except for the bit of white in his face, he looks like a much younger horse. You’d better believe he “knows” that he’s still a beauty, too. He carries himself in a regal way and has an amazingly intelligent eye. He still has “presence.” He’s still a horse that commands respect. I absolutely adored Sunshine Forever. As I write this, I still can’t bring myself to believe he is gone. I’m so glad I got to see him in August. He was hale and hearty then. If you are a long-time reader of my blog, you might remember me talking about Sunshine Forever in an earlier post. He was a favorite of my “mentor” and dear friend, Mark Yother. I initially went to see him at Old Friends as a sort of homage to my late friend. I ended up appreciating him for his wonderful personality and great story. 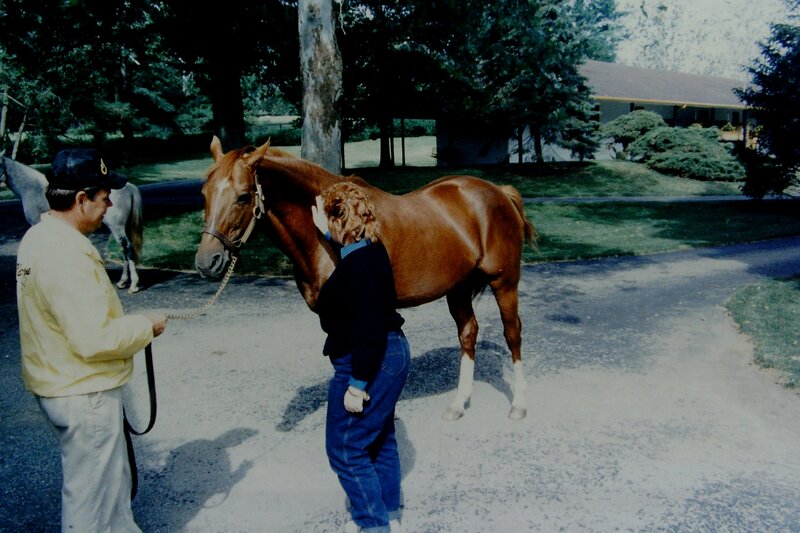 Sunshine Forever was foaled March 14, 1985 at Darby Dan Farm. This dark bay colt with the irregular white blaze was absolutely bred to do great things on the turf. A son John Galbreath’s great Roberto out of the Graustark mare, Outward Sunshine, Sunshine Forever was a prince in-waiting from the day he was born. The Eclipse Awards got it right when they awarded Sunshine Forever the 1988 Turf Championship. He amassed over $2-million in earnings while winning or placing in eleven graded stakes races. Among those were wins in the Grade 1, Man O’War Stakes, the Grade 1 Turf Classic, and the Grade 1 Budweiser International. My very first Breeders Cup was in 1988 at Churchill Downs. I was screaming and virtually riding Sunshine Forever in the B.C. Turf. He ran well, but was narrowly defeated by Great Communicator. That was the same year that Old Friends’ resident Gulch won the B.C. Sprint and Personal Ensign capped off her undefeated career in one of the most amazing races of all time in the B.C. 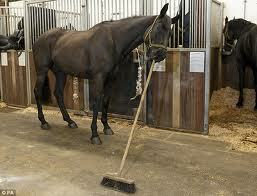 Distaff. Sunshine Forever went to stud and, eventually, lived at Nikka Stud in Japan. In 2004, Sunshine returned home to the US. This was a completely unique situation. 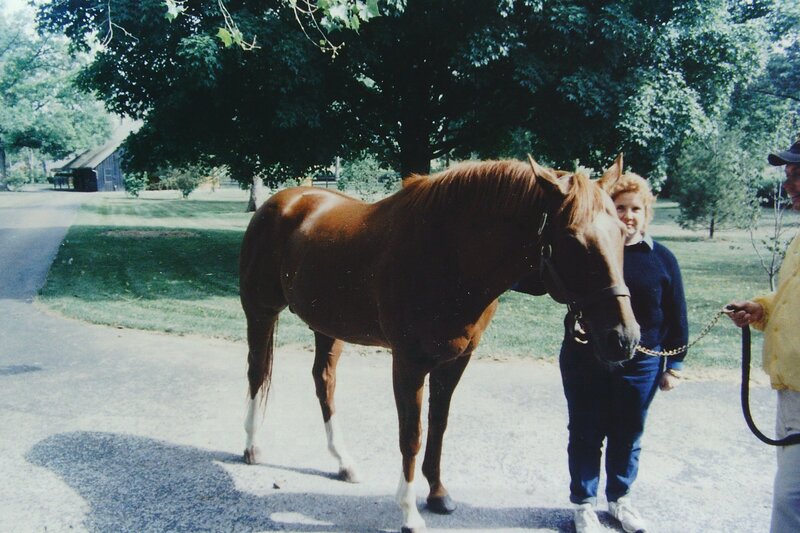 Not only was Sunshine the very first horse to be returned to the United States for his retirement, but this amazing animal was also to become the very first stallion to a new concept in the bluegrass. 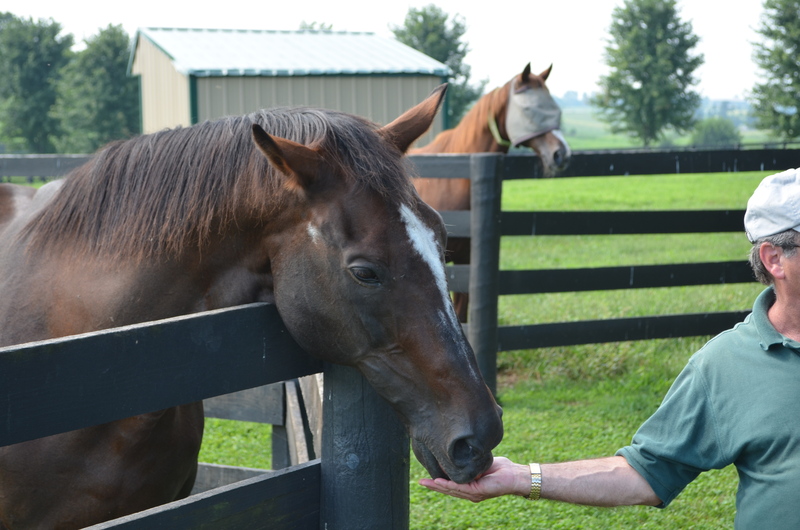 The concept was called “Old Friends – A Kentucky Facility for Retired Thoroughbreds.” Little did anyone involved with Old Friends at the time realize that within 10 short years Old Friends would have two locations (the original in Kentucky and Cabin Creek in New York), be home to over 100 retired racehorses, and be a “bucket list” destination for thousands of horse-lovers from around the world. In August (2013), I got to visit him again. This time, he allowed me the supreme pleasure of pulling his tongue. He was in a very mellow mood – even for him. Everyone on the group got to take photos with him and he was perfectly content to stand by the fence and receive carrots and adoration from all of us. Not even once did he pin an ear or appear to be even the slightest bit annoyed by all of us fussing around him. Ah, Sunshine, you were always a class act. Looking forward to “seeing you here on Colmel’s Blog!